For the most part, the war in Afghanistan has taken place beyond the view of news cameras. In near-Orwellian fashion, most Americans have been insulated from the painful realities of sustained combat. Because of that, it’s difficult not to admire the intense authenticity of director Peter Berg’s Lone Survivor, a movie about four Navy SEALs sent on a 2005 mission to kill a Taliban leader. Lone Survivor follows the rigorously trained and highly motivated SEALs from their base camp to a remote area in the mountains. Everything seems under control until an unexpected obstacle compromises the mission: An accidental encounter with a trio of goat herders threatens to expose the SEALs’ position. The SEALs then confront an ethical issue. Should they protect themselves and the mission by killing their captives? Should they tie the herders up, possibly leaving them to succumb to the rigors of the wild? Or should they let them go and abort the mission? The rules of engagement seem to argue for the last option, but ethics and extreme pressure don’t always mesh, and every possible decision harbors potentially disastrous consequences. Beyond that, the SEALs are fully aware that a wrong choice could result in a torrent of unwanted after-the-fact attention from a press that doesn’t take kindly to the killing of civilians. All of this makes for the most interesting part of the movie, but it seems like only a few minutes before the SEALs release the shepherds and begin to evacuate the area — which seems like the right choice. The downside, of course, is that the SEALs quickly are exposed to small army of Taliban fighters. The result: a vicious battle for survival that’s presented with all the harrowing realism Berg can muster. In a moment when SEALs are credited with many successes, it’s interesting to see a movie about a mission gone terribly wrong. No matter how well-planned a mission is and no matter how good the SEALs are at their jobs, there’s always a chance that something unpredictable will happen. In all, 19 men were killed, the bulk of them during an attempted helicopter rescue of the four stranded SEALs. Lone Survivor isn’t easy to watch; it’s unsparing in its presentation of the bloodshed of combat and the physical and emotional hardships faced by Americans stationed in a country where a good part of the population hates them. As played by Mark Wahlberg, Petty Officer Marcus Luttrell gradually emerges as the central figure in a band-of-brothers exercise that acknowledges and respects the warrior code that has been imbued in men whose bravery is beyond question. The men taking part in this mission include Marcus, Matt Axelson (Ben Foster), Danny Dietz (Emile Hirsch) and Mike Murphy (Taylor Kitsch). There’s a hierarchy here, but the SEALs work mostly as a team, and Berg makes it clear that the main motivation for the men involves their loyalty to one another. Berg understands how to maximize cinematic impact. An example: He films the death of team leader Murphy in agonizing slow motion, a self-consciously cinematic touch but one that works to expand the moment to the point at which it’s almost unbearable. In the heat and confusion of combat, other emotional moments can be found. It’s impossible not to be moved when a severely wounded Axelson tells Luttrell he wants his wife to know that he loved her, that he died with his brothers and that his heart was full. In casual, almost off-handed ways, Berg lets us know that these men have lives away from the alien world of Afghanistan’s battlefields — wives, girlfriends and children. It’s almost as if their jobs take them into an alternate universe. The movie’s title makes it clear from the start that three of the men aren’t going to make it, and we also know that the lone survivor of the title will be Luttrell, who — along with Patrick Robinson — wrote the book on which the screenplay (also by Berg) is based. After a ferocious combat section, the movie slows a bit as Luttrell tries to survive on his own, receiving assistance from friendly villagers, one of whom keeps him from being executed in a scene that’s as traumatic as anything else in the film. 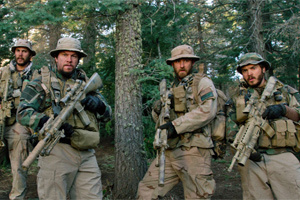 Viewed strictly in movie terms, Lone Survivor brims with relentless action and nerve-wracking tension. Berg, who has directed movies such as Battleship (awful) and Friday Night Lights (better), knows how rub our noses in the dirt of war, giving us as little time to reflect as the SEALs themselves have. It’s not the job of the SEALs, who sign up for particularly hazardous duty, to decide whether their sacrifices are absolutely necessary, certainly not during the brutalizing heat of battle. Lone Survivor leaves it to us to struggle with that question. We should.